Buying a home is arguably one of the most exciting decisions you can make, but it can also be the trickiest, especially when an auction is involved. This journey is sometimes hard to navigate with regard to the nuances involved in the auction process. Before purchasing a home at auction, here are some tips to avoid auction day headaches, know which professionals you need to engage and understand how you can get into your brand new home without stress (or at least with less of it). Before you consider buying, have the home you’re interested in inspected. This will lessen the likelihood of purchasing it and then finding major faults. To protect yourself from unseen costs and repairs down the track, contact a reputable company that specialises in this area and hire them to carry out any necessary checks. Your home insurer won’t cover the costs of fixing something that was present in the house before you purchased it. The vendor will expect you to do this and it is one of many costs involved in the auction process. Your home insurer won’t cover the costs of fixing something that was present in the house before you purchased it, so this step is important. In some cases the building and pest inspection will be carried out by two individual licensed inspectors. The inspectors can report their findings to you in person if you’re able to be present on the day, or they can contact you by phone. They’ll then supply a written report, for documentation purposes, in the following days. Carrying out this step means you can go into the auction knowing that there’s no hidden nasties in the property (giving you some peace of mind). Next, you need loan pre-approval. Getting home loan pre-approval from your bank or lender is crucial. What this means is that you’ll be able to make an offer on the day of the auction knowing that you have a loan ready to go. This is often referred to as conditional approval. Banks prefer you have formal approval before you go into the auction. The process involves a full application form, credit checks, employment history and a host of other verifications. It’s a process that can take weeks, so it’s important to look into pre-approval well before auction day. It’s also wise to shop around the various banks and lenders to find one that suits your individual needs. Ask your lender how long the process to get formal approval will take should you buy under auction conditions, as this can differ. Some banks prefer you have formal approval before you go into the auction, so you need to clarify this. Home loan pre-approval also sets a loan limit for you, so you don’t overbid on auction day and end up with a property that’s over your budget. A home costs hundreds of thousands of dollars, but a solicitor will only cost you a fraction of that. It’s a key step in the process that you find a solicitor you’re happy with and get them to take a look at the contract. The solicitor is skilled in identifying problems in complex contacts like this, and without having them look into this on your behalf, you could be stuck having to pay unforeseen costs after sale. Remember, there are no “cooling off” periods in auctions, so if you’re the highest bidder, the home is yours — warts and all. There are numerous applicable fees during the loan process (bank cheques, requests for copies of documents, admin fees and more), and your solicitor will be able to identify if all of these are satisfactory. Once your solicitor has given the contract the all-clear and you’re happy with what’s outlined, you can then sign it and return it to your lender. Auction day is fast paced and can sometimes be disappointing. It’s wise to go into an auction expecting the price to inflate by at least 20 percent. You’ll watch the sale price of a home inflate significantly (and quickly) and it might leave you feeling like you poured money into pre-auction steps for a home you were never able to afford. Understand that many agents underquote the sale price of a home. It’s wise to go into an auction expecting the price to inflate by at least 20 percent. As a rule, a home is worth whatever the market is willing to pay for it, so be aware that the sales figure an agent tells you is a very loose guide. It’s also wise to refrain from telling the agent too much about your budget or your eagerness to buy the home. Remember the agent wants to make as much on the home as possible. Do some research and check the sale prices of comparable homes in the area. This will give you an idea of what price guide they were given originally and what they ended up selling for at auction. On the day of the auction, be cautious with your bidding and never bid too soon. You may want an agent or neutral third party to come along and bid on your behalf, especially if you’re inexperienced. Hold off bidding until the property reaches reserve. This lets you know the lowest price the house is allowed to go for. 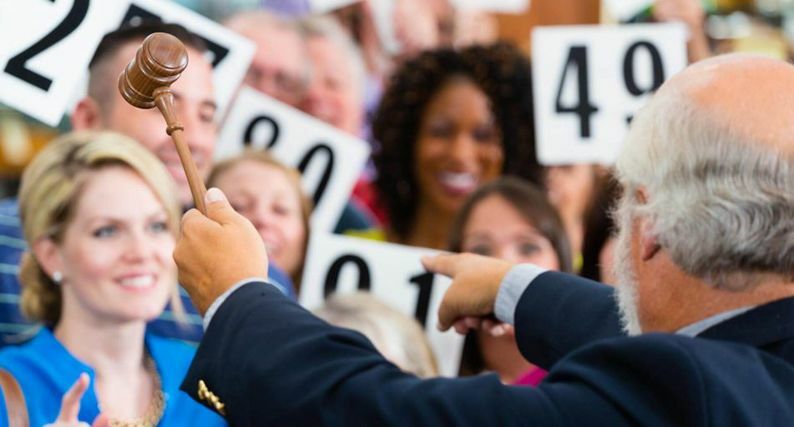 Frank Valentic, of Advantage Property Consulting, says it’s important to keep in mind the gamesmanship that can work to your advantage while at an auction. “Dressing to impress can create the impression that you have an endless budget and can intimidate others so they stop bidding earlier,” he says. This won’t necessarily result in getting the home you want at your desired price, but it can subtly work to your advantage. You might also want attend some auctions for other homes in your area before you step up to the plate. This will help you get a feel for how auctions work, and build your confidence when one you want to take part in arises. A safe rule on auction day: Hold off bidding until the property reaches reserve. This lets you know the lowest price the house is allowed to go for. Never reveal what your highest bid is too early. Play it safe and bid in small increments as competition tightens. This approach can save you a lot of money. Agents will be present, and they’re likely to apply pressure to make a sale or raise the sale price. Keep calm, don’t succumb to pressure and do your best to temporarily remove yourself from any emotional ties you feel for the property. Most importantly, never go over your budget. You can’t afford to. Getting a pre-approved loan is a great safeguard. If you are the winning bidder, you’ll need to pay a deposit on the day of, which can range from 5 to 10 per cent of the purchase price. Have a cheque book with you going into the auction so you’re not caught out. Don’t cut corners and understand that the entire process can take months. The auction process doesn’t have to be overwhelming. The key takeaway is to ensure you carry out all the essential checks and engage all the necessary professionals. Doing this will reduce your costs, keep stress at bay and make the journey as smooth as possible. Don’t cut corners and understand that the entire process can take months. Plan and keep perspective. Don’t get too emotionally involved and only commit to purchasing a property that you’re 100 per cent happy with and that you can afford. If you are looking to purchase a house ready our article ‘4 Red Flags when looking to buy a Home‘ and be sure to get your home and contents insurance with Budget Direct.